Artist and body painter Shannon Holt's stunning new series, "Florida Wildlife," features realistic portraits of animals painstakingly painted on human figures. 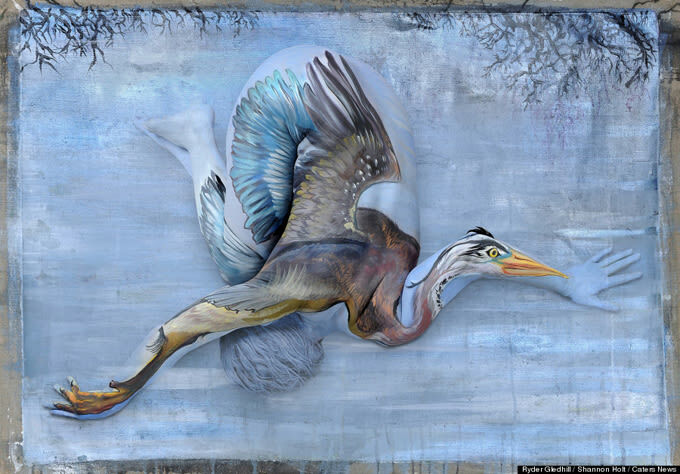 Historically, body painting has be used to celebrate, terrify, and even to create visual illusions, but recently artists have taken full advantage of the emerging fine art status of the practice. Like some of her peers, Holt is renowned for her mastery of the genre and her skillful use of color. She spends over 12 hours on each piece before photographing the work. Holt does her body painting in photographer Ryder Gledhill's studio, and Gledhill exclusively photographs her body art. She also accepts custom commissions.